Is my Twitter password “HowardDeanLuvva420" or “HowardDeanLuvva69?” Ha ha, hi, I’m Joanna Rothkopf. Don’t you hate when you forget the password to your various social media accounts, making it physically impossible for you to clarify to your state whether or not it should be bracing for an incoming ballistic missile attack? So does Hawaii Governor David Ige. According to the Washington Post, just two minutes after the Hawaii Emergency Management Agency alerted state residents to their impending deaths, Gov. Ige was aware that the message had been sent in error. But he failed to send any sort of reassurance to his constituents for 17 minutes—because he forgot whether his password was BeachTime1 or BeachTime2. (I recognize that Hawaiians don’t only think about beach time—they have just as many interests as someone who lives in a land-locked state or on a peninsula.) He waited 23 minutes to post to Facebook. The tweet in question. Via Twitter. 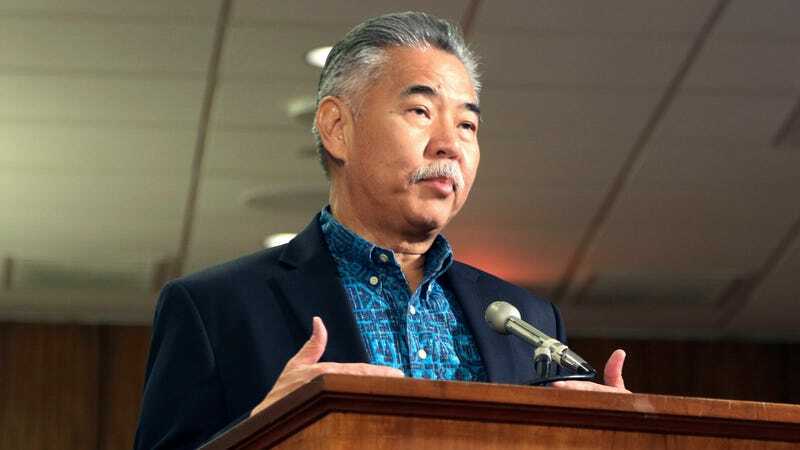 “I have to confess that I don’t know my Twitter account log-ons and the passwords, so certainly that’s one of the changes that I’ve made,” Ige told reporters on Monday, explaining the gap. To be fair, he beat the president, who still hasn’t tweeted about it.